Eco-friendly wall decals are all the rage and much easier to find than they used to be. 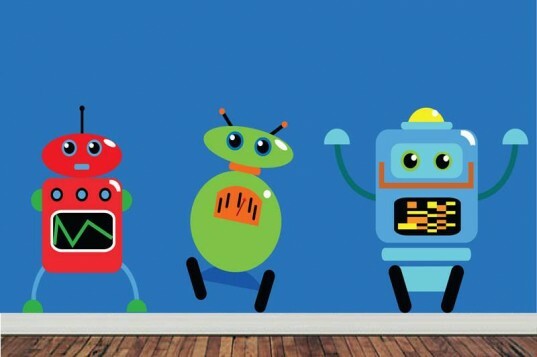 When shopping for wall decals avoid typical vinyl which can expose your child to excess polyvinyl chloride (PVC), lead, phthalates, cadmium and other harmful chemicals. Fabric wall decals have other benefits too -- you can reuse them again and again and they won't crinkle up on you. 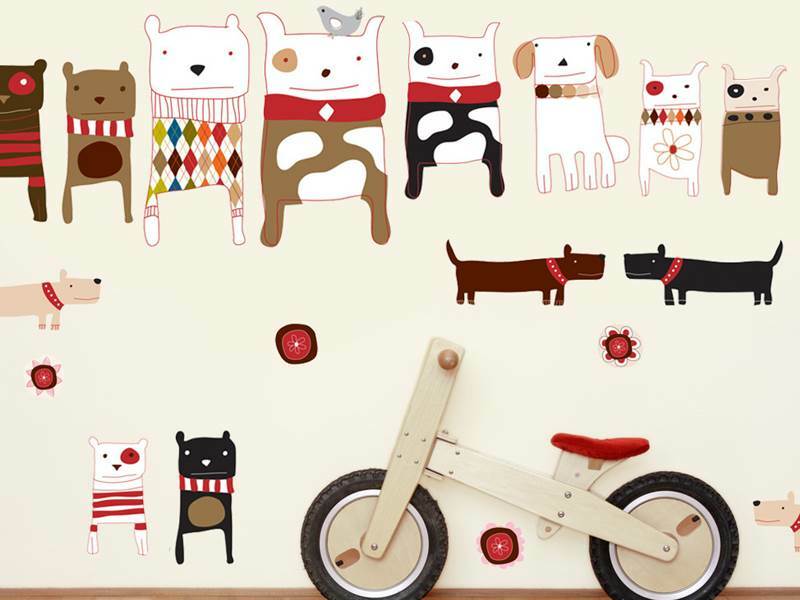 Keep reading to learn about 6 cool Etsy shops that offer kid-friendly wall decals in a variety of super cute designs such as the adorable modern puppy dog decals shown above. Eco Wall Decals offers dozens of choices in their Kids Wall Decals and Baby Nursery Wall Decals line. They’ve got animals, trees, dinos and so much more. Plus plenty of beautiful color schemes to choose from. All Eco Wall Decals are made of fabric, are super durable and easy to move around on a whim, plus non-toxic, green and PVC-free. These decals can also be personalized with your child’s name, a favorite quote or other info. 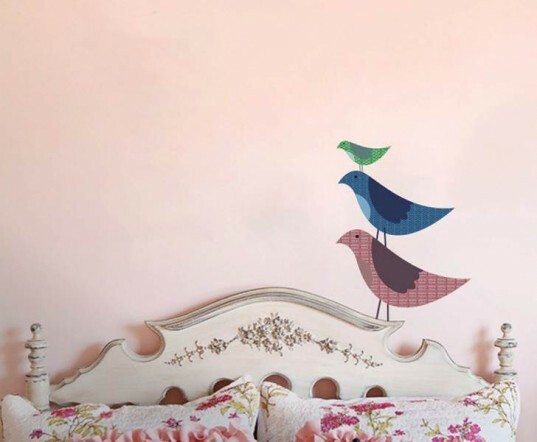 Decal Vinci has a very small but lovely artistic collection of wall decals in delicate designs and colors. All decals are fully removable fabric wall decals leaving no icky stick residue and are 100% made locally for those in Brisbane, Australia – though shipping to the USA is available. I highly suggest you check out their beautiful and unique alphabet decals. MyWallStickers by My Wonderful Walls has many excellent fabric decals for kids rooms, the baby nursery, playrooms and more. 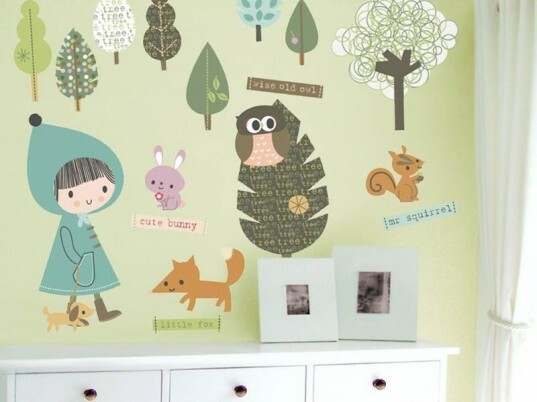 Part of the beauty of this Etsy decal shop is that most of their decals are easy to mix and match, meaning you can create never-ending new mural designs on your child’s wall. Tons of themes are available in designs like dragons, spring trees, owls, dinosaurs, hot air balloons, forest scenes, teddy bears, pirates, polka dots and many more. This shop also has many unique decals that look 3D, almost like stained glass, but still lay flat on the wall. This shop offers free shipping in the USA if you spend $90+ and will also send you a free sample of their Safe Cling Fabric Wall Stickers so you can try before you buy. Studio Wall Stickers offers fabric wall decals made with ultra-premium, polyester-based matte decal media. This material is kid friendly, non-toxic, and phthalates and PVC free and the shop prints every decal with eco-solvent inks. Studio Wall Stickers are super thin, look like paint on the wall once applied, but can be easily reused and re-positioned. Every decal in the shop is made to order and can be customized to fit your space. You can even ask for custom colors and sizes. Sunny Decals offers a wide selection of jumbo sized fabric wall decals and wall stickers for nurseries, kids rooms, playrooms, schools, and more. All decals are made with the highest quality fabric materials and eco friendly inks and do not require any special tools or transfer paper to apply. The shop carries a wide variety of themes and are constantly adding new ones to their collection including dinosaurs, princess, knight, dragons, hot air balloons, transportation, airplanes, trucks, trains, jungle, candy land, balloon animals, outer space, rainbow, under the sea and more. They also offer free shipping on all orders over $100 anywhere in the USA. Chocovenyl is about the most adorable place to shop for fabric decals. With amazingly cute designs, lovely color schemes and tons of styles to choose from, this shop does not disappoint. All stickers are designed by leading artists to inspire children of all ages and come in styles ranging from vintage nostalgia to urban cool, whimsical woodland scenes to funky dinosaurs and plenty of fairy tale magic thrown in for good measure. Each set of wall decals are created with high quality fabric (PVC free) and are printed in rich colors using eco-friendly inks. Plus, like other fabric decals, these can be reused, removed and re-positioned with ease. Eco Wall Decals offers dozens of choices in their Kids Wall Decals and Baby Nursery Wall Decals line. They've got animals, trees, dinos and so much more. Plus plenty of beautiful color schemes to choose from. All Eco Wall Decals are made of fabric, are super durable and easy to move around on a whim, plus non-toxic, green and PVC-free. These decals can also be personalized with your child's name, a favorite quote or other info. 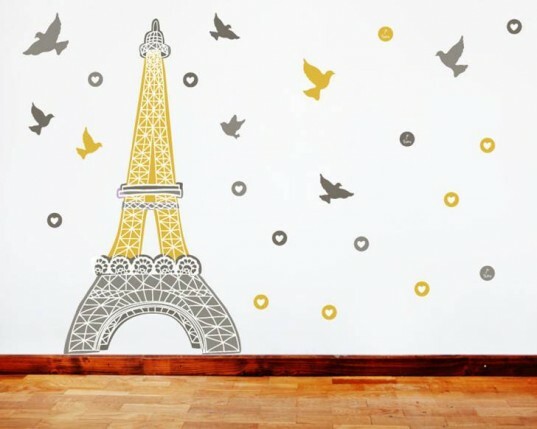 Decal Vinci has a very small but lovely artistic collection of wall decals in delicate designs and colors. All decals are fully removable fabric wall decals leaving no icky stick residue and are 100% made locally for those in Brisbane, Australia - though shipping to the USA is available. I highly suggest you check out their beautiful and unique alphabet decals. MyWallStickers by My Wonderful Walls has many excellent fabric decals for kids rooms, the baby nursery, playrooms and more. 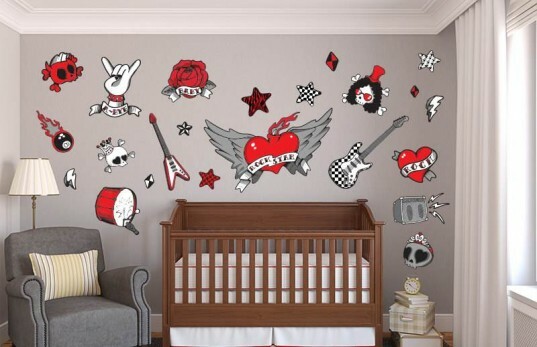 Part of the beauty of this Etsy decal shop is that most of their decals are easy to mix and match, meaning you can create never-ending new mural designs on your child's wall. Tons of themes are available in designs like dragons, spring trees, owls, dinosaurs, hot air balloons, forest scenes, teddy bears, pirates, polka dots and many more. This shop also has many unique decals that look 3D, almost like stained glass, but still lay flat on the wall. This shop offers free shipping in the USA if you spend $90+ and will also send you a free sample of their Safe Cling Fabric Wall Stickers so you can try before you buy.